CORRECTION: The original article had an old flyer with a different date. 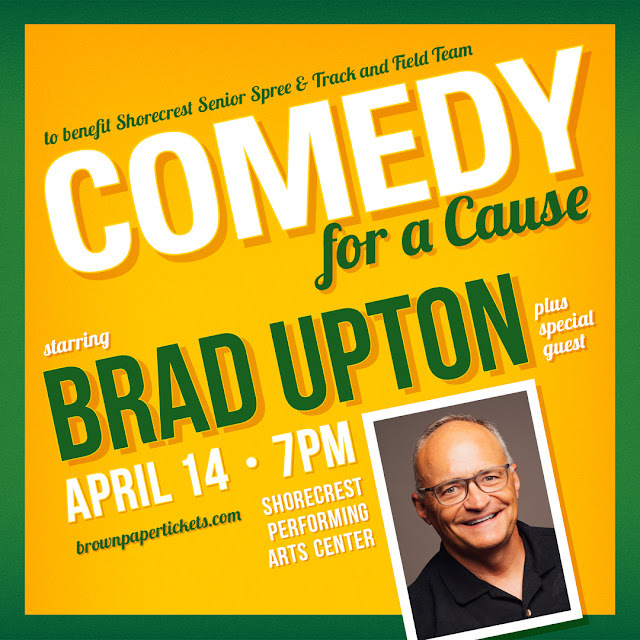 Enjoy a night of Comedy for a Cause on Sunday April 14, 2019 - 7pm, at the Shorecrest Performing Arts Theater, 15343 25th Ave NE, Shoreline 98155. Brad Upton, professional comedian, will entertain. Brad is a Shorecrest graduate who ran track while in school. He is happy to use his talent and success to benefit his high school. The proceeds benefit Senior Spree 2019 and Shorecrest Track and Field team. Spree is the alcohol and drug-free, supervised overnight party for graduating seniors. Tickets are $12.00 in advance and can be purchased online. $15 at the door. For cash or check purchases contact: Mary Sierchio 206-240-9295.